The architects practice gmp has won the competition for Nanjing Financial City II and has been commissioned to produce the master plan and the design for the first development stage. The design for the large-scale financial center is based on intricate detail and references to Nanjing’s historic city structure. After its successful participation in the competition for the design of “Nanjing Financial City – Phase II” von Gerkan, Marg and Partners has been commissioned with the design of the first of two development stages of the new finance and business center. 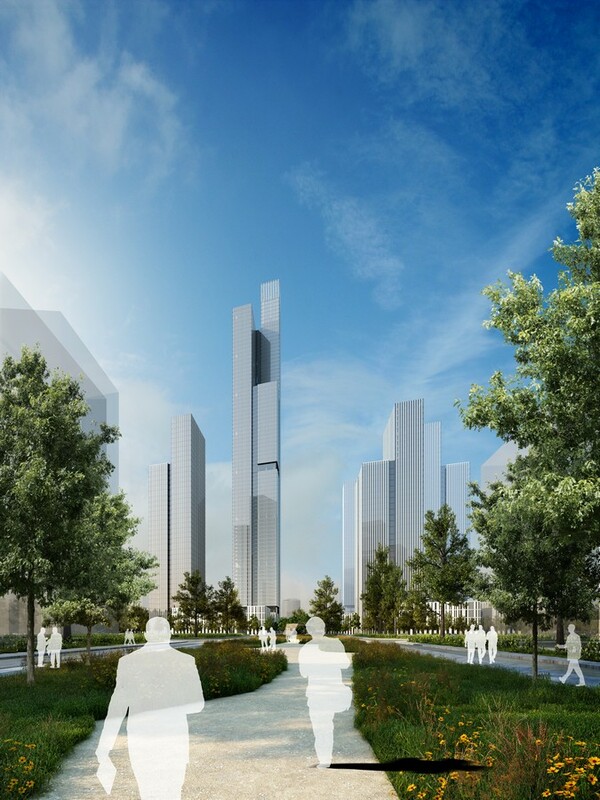 The site of “Nanjing Financial City – Phase II” lies to the south-west of Nanjing’s inner city next to the trade exhibition grounds, and is the key project for linking two urban axes in Nanjing’s expansion area Hexi New Town. 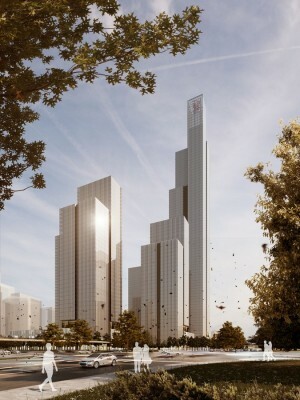 The Hamburg architects were already successful with their design for the first phase of “Nanjing Financial City”, which is now under construction. 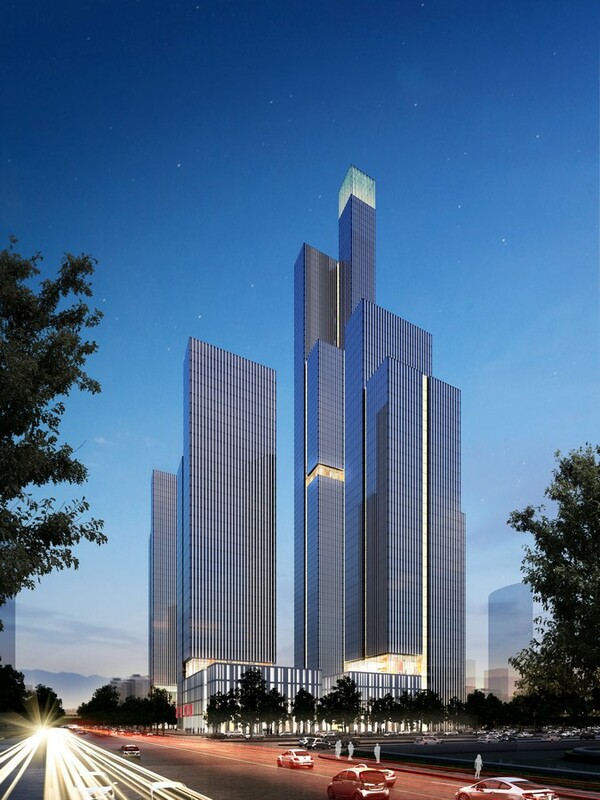 For phase II of Nanjing Financial City, gmp Architects propose an ensemble of five high-rise buildings with heights of between 157 m and 415 m. The idea is to create a business district with an unmistakable urban quality and its own identity. The master plan produced by the practice provides a 415 m high tower block directly at the crossing point of the “Youth Olympic Club” axis and the “Central Business District” axis, which will create a landmark with a strong recognition effect. The 65,000 sqm site will be developed into an urban quarter with mixed uses, including offices in combination with an upmarket infrastructure for numerous conference and meeting facilities, as well as serviced apartments and shops. 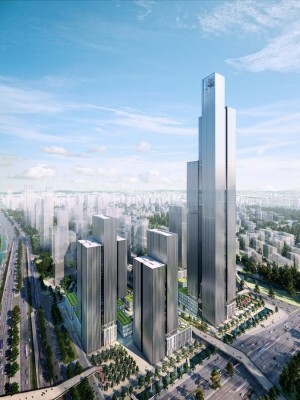 The green axis, which runs from north to south and crosses the completed Central Business District and both development sites of Nanjing Financial City, divides the overall site of phase II of Nanjing Financial City into three parts. On the two outer development sites, the architects are planning high-rise buildings in line with the road layout and the specified building lines; the western of the two sites is currently being designed. The third area is part of the crossing green axis, creating a breathing canyon in the midst of the high-density high-rise building structure. 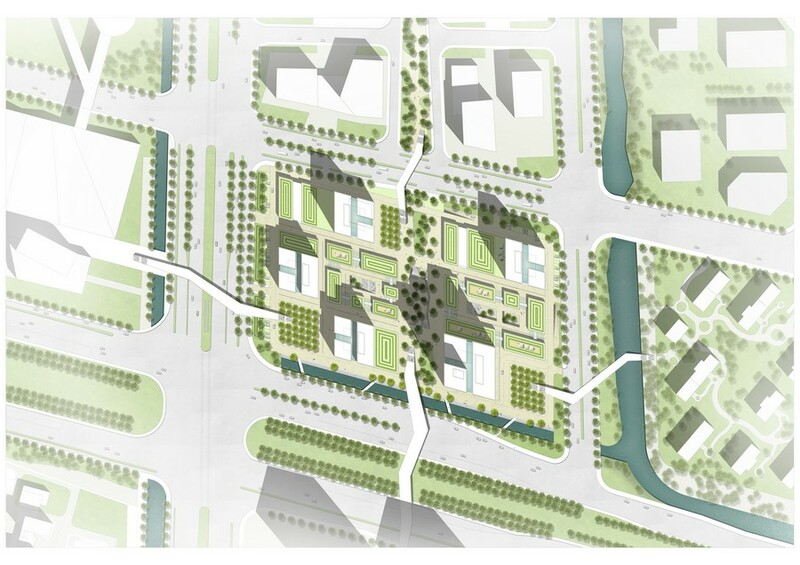 This green canyon – with its squares, sunken courtyards, and landscaped areas – will become an integrated part of the retail zone. This area has the benefit of spectacular vistas to the surrounding architecture, and the quarter is connected to its neighborhood via pedestrian bridges. In order to provide a structure to the overall building volume with its 500,000 m² of net floor area above ground, the architects use joints to divide the building façades. Vertical recesses define the outer shape of the buildings, and horizontal inserts define the functional uses. Four-story structures form the plinths of the outer towers. In the interiors of the respective parts of the site, these plinth buildings are supplemented by three-story retail developments with a small-scale structure. 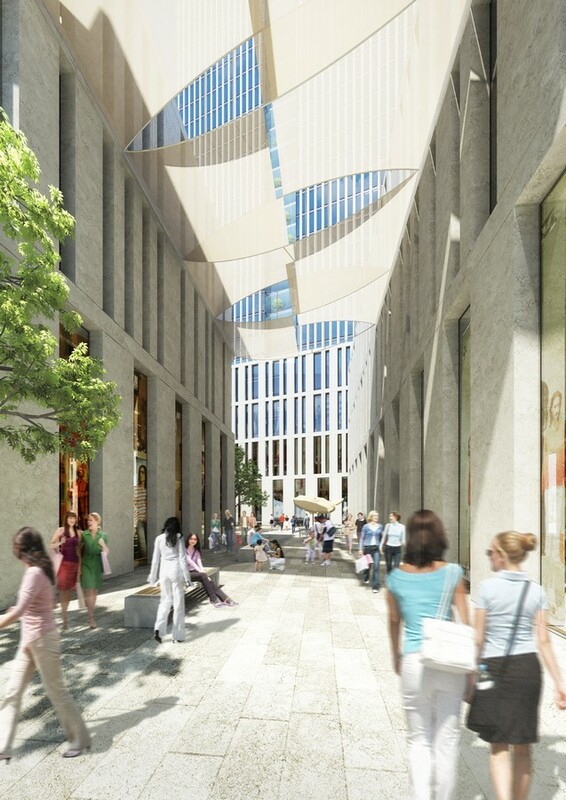 Perforated façades of natural stone slabs in the lanes and squares generated between these buildings create a pedestrian-friendly and familiar atmosphere of a scale that is reminiscent of historic inner cities. This internal structure is rounded off with market squares in each development site. The plinth level is dedicated to pedestrians and open-air shopping, and creates a deliberate contrast to the classic indoor shopping mall. 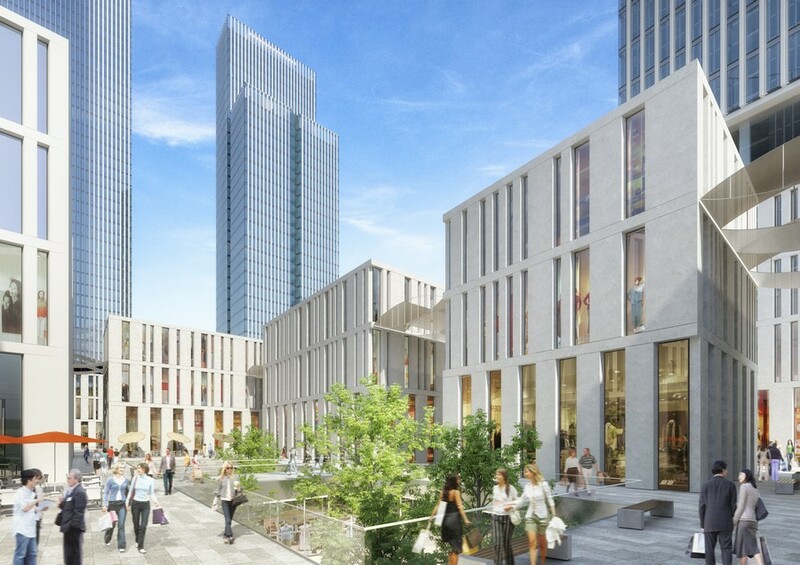 It is not only joints that separate the retail area from offices, hotel and serviced apartment areas in the tower blocks. The business world, which can be seen by pedestrians in the “inner city” by looking up, is characterized by transparent, vertically structured steel/glass façades that contrast with the plinths. The public areas for shopping, dining, and strolling almost seem to belong to a different era, while the business façades of the towers above reflect state-of-the-art modern high-rise architecture. 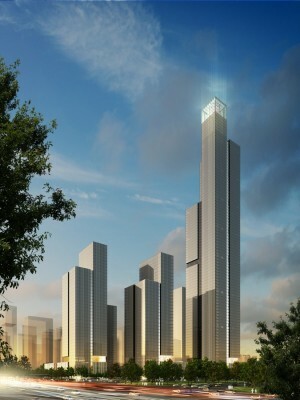 Even though the new high-rise quarter appears very modern, even futuristic, at first sight, the design was nevertheless inspired by a local and historic building monument – Nanjing’s city wall, dating from the 14th century which, with its length of 35 km and conspicuous city gates, is considered the longest city wall still standing in the world today. The stone plinth of the ensemble which, with its small-scale squares and lanes is reminiscent of the historic inner city, and which, like the city wall, can be accessed on foot at a higher level, seems to adopt the principle of “city wall” in a modern form and at a different level of scale. Planted roof areas as “fifth façades” and recesses in the towers provide numerous viewing points analogous to the structure of the ramparts. This modern “city in the city” is flanked by the five towers. The architects’ search for the specific character of the place and the city of Nanjing is the base for creating familiar exterior spaces with urban qualities at a human scale in this newly developed area, which gives this city quarter its own identity.